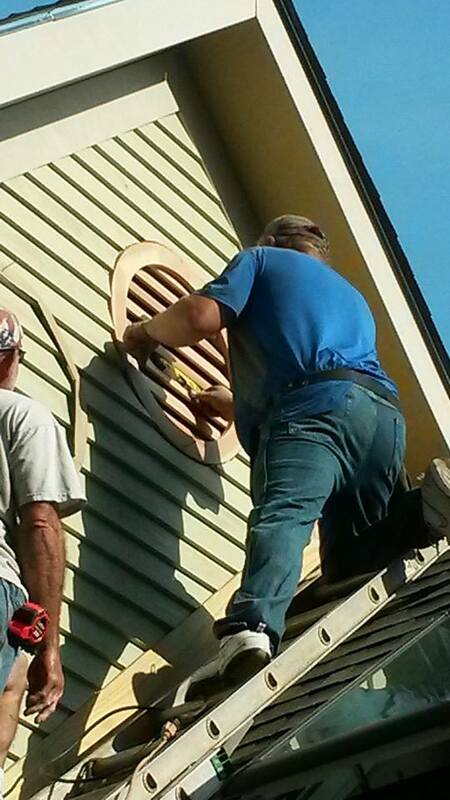 Learn how to cut wood siding around a round louver with great speed and amazing precision. This technique for works for wood and Hardie plank siding. The process is very simple; the real deal is tedious. Run the siding in the gable as normal. Plumb down from the center with a 4′ level; make a good mark. Find the vertical center of the louver. Place the louver against the siding in reverse. Establish a quality pencil mark around the perimeter of the louver. Saw the siding with an oscillating tool such as the Sonic Crafter. Test fit the louver in reverse in the hole in the siding. Tack up a series of triple 1 1/2″ blocks around the perimeter of the hole. Use the blocks to exactly position the louver and mark the rough opening. Mark an extra 1/4″ around the rough opening. Use a reciprocating saw with a bi-metal blade to saw the opening. Note: Do not saw through any member of a truss without proper approval. Set the louver in the openings and use a torpedo level to establish its position. Nail it in with the proper fasteners according to the job. Re-nail any siding as necessary on their ends.